Exotic sights, scents and sounds reign in this fascinating land where Europe and Asia meet. 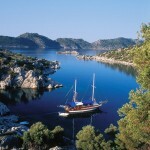 From Istanbul, magnificent “Empress of the World,” to ancient ruins, stunning landscapes and the dramatic Turquoise Coast where we board privately chartered “gulet” yachts for a distinctive four-day voyage, Turkey engages and beguiles, offering us an unparalleled small group experience. Day 15: Depart for U.S. Spend four days and three nights in Cappadocia. Hagia Sophia Museum: initially built as a church, then converted into a mosque for hundreds of years, before finally becoming a secular museum. 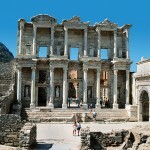 The Library of Celsus is an ancient Roman building in Ephesus, Anatolia, now part of Selçuk, Turkey.